Mascus www.mascus.ie has enjoyed a fruitful and busy week on the world’s largest construction machinery fair in the world, BAUMA. 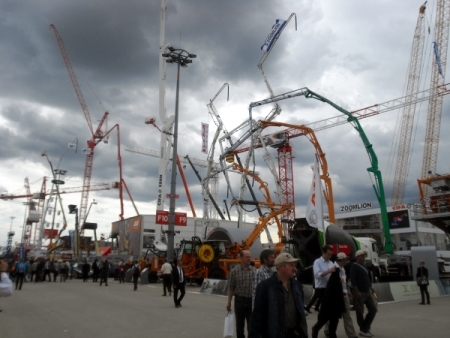 530 000 visitors from 200 countries came to Munich and visited Bauma in April 2013, this is a record for the fair. According to latest reports, the trade show was extremely successful for all the exhibitors, some of them registered the highest amount of machine orders ever, a positive sign for the industry. As the world’s largest online market place for used construction equipment, Mascus was proud to be part of this incredible event, holding a stand together with their partner Lectura. The all team has been visiting customers and prospects but also distributing Mascus giveaways at the entrance of the fair and made the Mascus brand shine all over the show. “We’ve advanced so quickly and brought online so many groundbreaking developments over the past 12 months that we really wanted to show people what Mascus is all about,” comments Mascus CEO Tim Scholte. “We’ve already established ourselves as world leaders in the sale of other categories of machinery, and we wanted our construction partners to know more about what we can do for them too,” he adds. 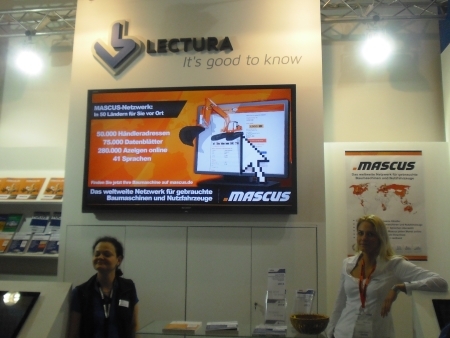 Mascus’ partner at the Exhibition was Lectura, a German company with a considerable online presence themselves which provides online access to technical data on over 70,000 makes and models in over 340 categories. The Bauma 2013 expo was a huge success, with over 555,000 m² of exhibition space, 3,420 exhibitors from 57 countries and 530,000 visitors from over 200 countries, making it the largest exhibition of its kind in the world. While primarily designed to showcase the world’s best in construction machinery, the expo also covered a wide range of other categories. “Mascus has become a world leader by providing comprehensive online platforms in multiple languages and covering everything from construction to forestry and transportation, comments Tim Scholte. “That makes an expo like Bauma 2013 hugely important to us, because it is the perfect opportunity to showcase our own service,” he adds. The event was a huge success, and everyone agreed that despite a still-chilly economic forecast, the construction industry has a lot to look forward to in 2013. “There was a fantastically positive atmosphere throughout the exhibition, and it was also a great opportunity for us to meet so many of our clients face to face,” comments Tim Scholte. We definitely plan to be back for the next Bauma expo, and hopefully we’ll have even more new and innovative products to show to our customers!” he concludes.